NOTE: This is a reference, mainly for myself and others, condensed from a much more verbose article which does a lot of hand-holding for Git newcomers, and attempts to explain what is going on in a little more detail. 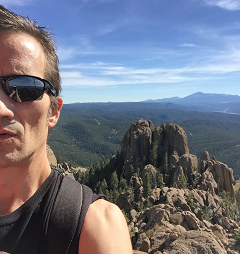 Also, if you are newer to Git you might want to review my introductory posts on Getting Started with Git and a Handy Git Command Line Reference. While these tutorials were originally targeted at Windows developers, the information is pretty universal. Also, you might benefit from the more through treatment of this topic in the full-fledged walk-thru. I’m new and/or I enjoy reading. Take me to a full-fledged walk-through! In the above, the file name is optional, but without a specific file name, git will interactively move through all files with un-staged changes. Best to include only the file or files of interest. On occasion, we perform a number of changes in the same code file, and then, after laboring to get it right for hours, we realize we have introduced unrelated changes, to different parts of the file, which should really be in separate commits. 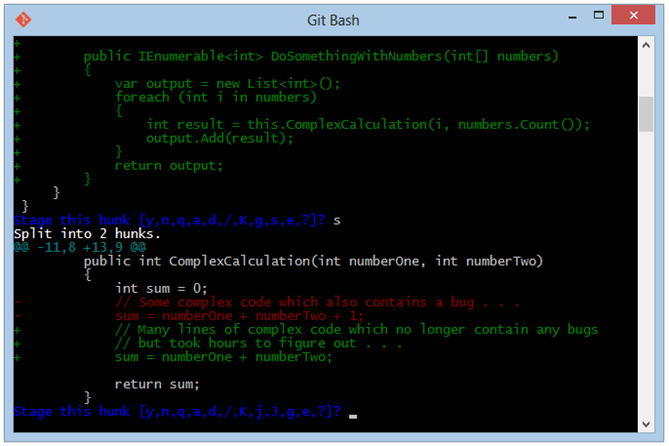 // Some complex code which also contains a bug . . .
// Many lines of complex code which also contains a bug . . .
// but took hours to figure out . . .
Only now do we come up for air long enough to realize we should have done the bug fix separately from adding our new method. For one, we might not be done with our feature yet, but the bug fix is critical and should be able to be merged back into master immediately. Also, it simply makes sense that a bug fix in the existing code base should be a singular commit, separate from adding new code. What to do? What we would like to do is create a commit for the bug fix first, separate from our newly added feature code. Here is how. 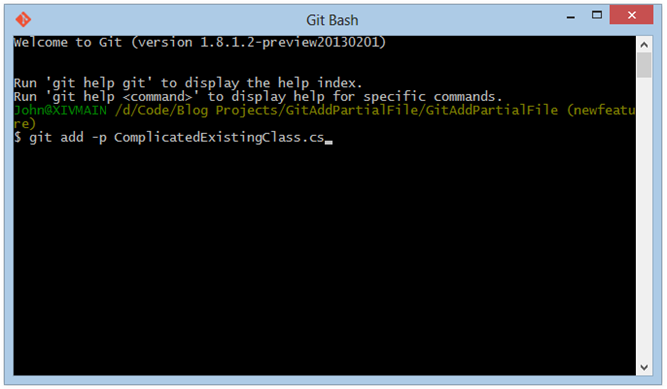 We can now use the git add –p to do this interactively, and stage our code in patches. With git add –p, we will selectively add chunks of a file (or files) from our working tree to the staging area, enabling us to select discreet chunks of changed code and build separate commits with pieces of a file or files. See the stuff called out in the red box? this represents the first chunk of changed code git has identified in the file. The changes are shown in green, and surrounding (unmodified) code is shown in white for context. 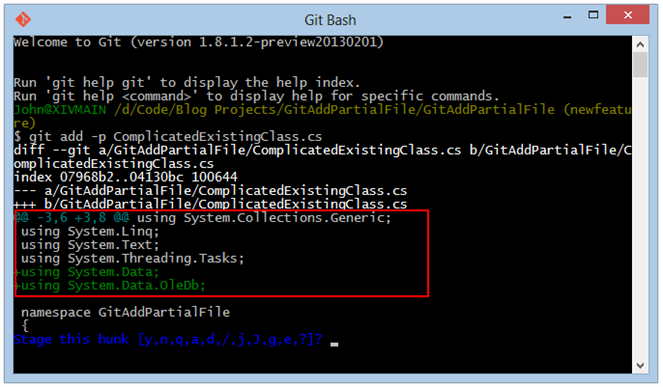 Also notice the text in blue at the bottom of the window, with a prompt waiting for us to tell git what to do. The prompt is waiting for us to enter one of the options from our table above. Now we are ready to commit our bug fix. After we do that, we can then stage our newly added feature code in the normal fashion and commit. In this article I walked through this as briefly as I could while including sufficient examples and illustrative screenshots to show what is going on. There is more detail in the full tutorial Git: Interactively Stage Portions of a Single Changed File for Commit Using git add –p.